Our Lord carrying His Cross. Catholic Spain is matchless when it comes to Holy Week. 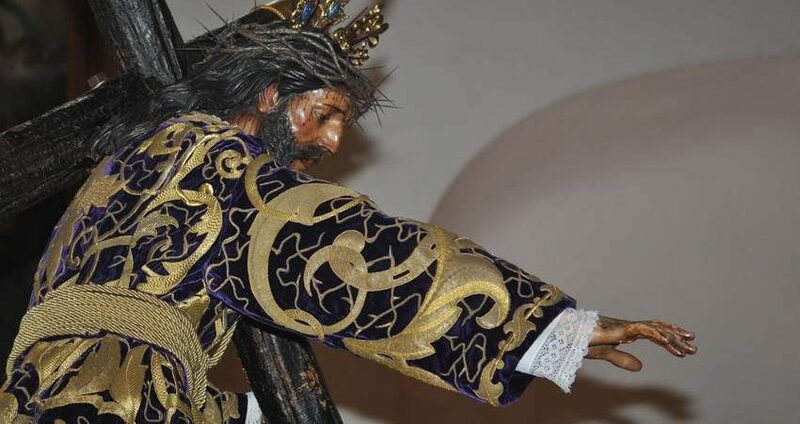 For 500 years the Spanish faithful have commemorated the Passion of Our Lord with marvelous public processions, ceremonies and penance. The stunning pasos of Our Lord and Our Lady continue to inspire souls to this day. The videos feature Holy Week processions in Seville and Malaga. Here are 4 breathtaking videos. In this video: María Santísima del Rocío, Malaga, Spain. In this video: Our Lady of Hope of Macarena, Seville, Spain. In this video: Our Lady of Triana, Seville, Spain. The gravity of sin allows us to understand the importance of penance. In the Middle Ages -- when these penitential robes and hood originated -- the awareness of the gravity of sin was far greater than today, and people would do penance not only in private, but also in public to give testimony to the horror of sin and the need to make reparation. However, the Catholic Church was careful of protect the identity of the penitent, especially if the sin committed was not public. Therefore, the penitent wore a robe and a high hood to conceal his identity. The high-tipped hood and the solemn robe with cape make it impossible to know who the person wearing it is; all that remains is a grave reminder that sin calls for reparation. This garment also serves to prevent the possibility of a penitent becoming proud of his penance, since no one can recognize him. Subscribe to our weekly e-newsletter for free. STOP Blasphemous Speaker at Santa Clara University. Defend Our Lord.